It seems that you can’t turn around anywhere without seeing a new tiny house tv show or feature on a website or even in a magazine. I’m the first to admit that I really like the idea of a Tiny House, but I have so much stuff! Well, Otter Pops, a staple of the parental grocery basket for the past 47 years, harnessed the power of the appeal of tiny houses to attract attention at retail stops like Walmart and major events like iHeart Radio Wango Tango Concert and the World Series of Beach Volleyball, to name a few. 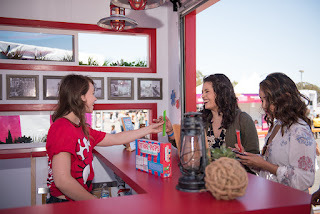 The 18-foot by 26-foot Otter Pops “bungalow” has a beachy, industrial-cool feel with cedar wood planking, metal and wire deck railings with the brand’s signature blue and red logo colors and whimsical otter characters as accents. The space offered an immersive experience by giving passerbys a place to "chill out" (see what I did there), play games, watch TV, and of course, sample Otter Pops served up by Poptenders!Now that’s big thinking in a small space!